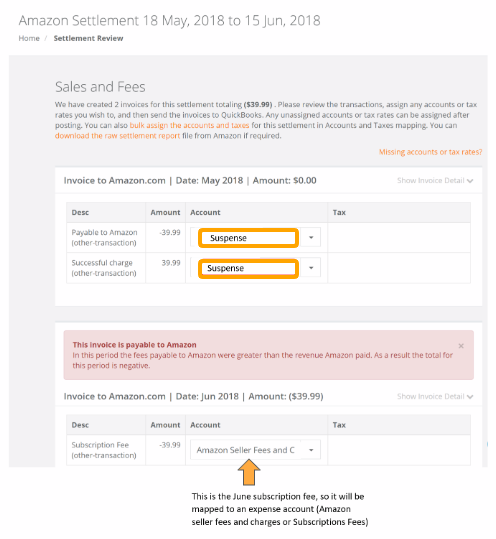 Payable to Amazon / Successful Charge: What are they and how do I account for them? The goal for any Amazon seller is to be profitable, so that Amazon pays you money. However there are some situations where you owe Amazon money, and in this article we talk about the different scenarios when that happens and how to account for them. The accounting for Payable to Amazon amounts and Successful charge transactions can be tricky but once you understand the process it all falls into place well. This article explains the process of accounting for these transactions through looking at two examples. The two examples below cover both possible options when you owe Amazon. If the amount is significant, Amazon will charge your credit card immediately for what you owe them. If the amount is small, they will simply carry over the debt into the next settlement, and charge you for the amount you owe from the proceeds of your next settlement. The actual entry containing all the sales/fee data that overall equals the payable amount. A 'Payable to Amazon' transaction line within a settlement or a single settlement only containing the 'Payable to Amazon' line. 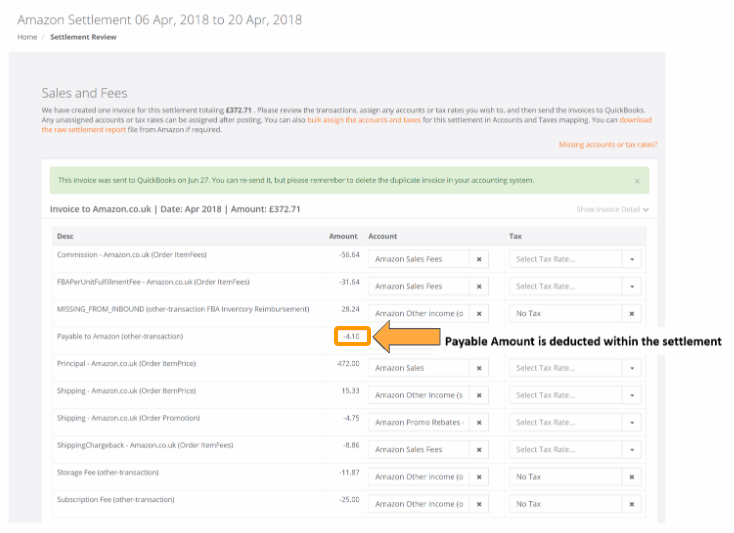 We can see the first settlement in the A2X account covers the period April 21 through to May 19 and has a total of -39.99. Between this point and your next settlement arriving you see the charge come through on your Credit Card bank feed in Xero/Quickbooks Online - you can now reconcile this charge to the entry made above. So you will be able to match the charge on the card to the settlement entry above containing the expense line. Partway through June the next Amazon is issued. This settlement covers the period 18 May to 15 June and the May portion of the settlement includes the details of the charge to your credit card. In your settlement you will see a 'Payable to Amazon' line and a 'Successful charge' line. Because we have already matched the credit card charge to the expense entry we can simply allocate the Payable to Amazon and Successful charge lines to either a clearing or suspense account because they will net each other out to Zero. But in doing so, we have still kept the audit trail as per the settlement issue but we have easily dealt with the three lines for the one charge. Expense account entry for the subscription fee that gets reconciled against the charge on the credit card. Debit and Credit entry to a clearing or suspense account to allocate the Payable to Amazon and Successful charge lines. But what happens when Amazon deducts the payable amount from your next settlement? This is dealt with a little differently as shown below. So we start with a settlement that covers the period 23 March through to 6 April. In this case the 4.10 payable amount is made up of the total settlement - so all sales, fees etc for the period are taken care of within the settlement but the overall total is the payable to amazon amount of 4.10. 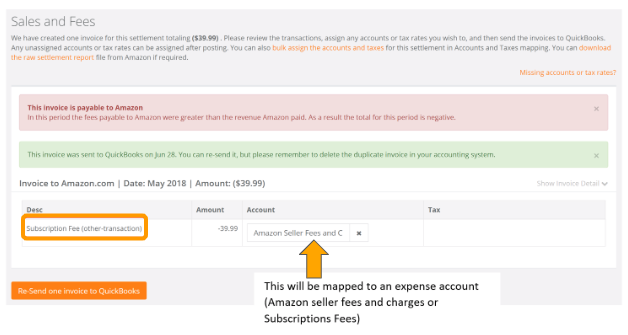 Rather than charge your credit card this time, Amazon knows you have sales going through your account therefore you should be able to cover the fee as a deduction from your next settlement. So your credit card is not charged the 4.10. So how is this all accounted for in Xero or Quickbooks Online? The simplest way is to create a bank clearing account in your accounting system. This allows you to allocate the payment of the original payable entry and also the Payable to Amazon line on the next settlement. Here's where it gets a little tricky and there are two methods - one for Xero and one for Quickbooks Online. You will manually mark the bill as paid in Xero by allocating the payment to the bank clearing account (if you open the bill you will see at the bottom where you can allocate a manual payment - the bank account you select here will be the bank clearing account). 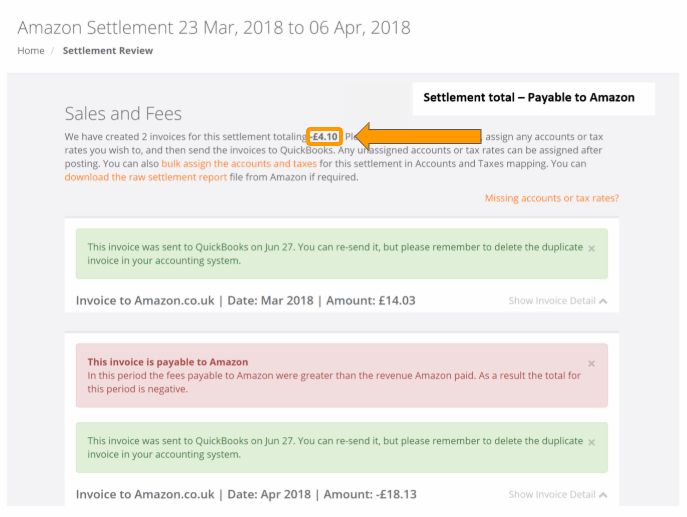 You will allocate the 'Payable to Amazon' line in the next settlement to the same bank clearing account which will mean the clearing account will contain a debit and a credit for the same amount netting the balance of the clearing account back to Zero. You will change the bank line in the A2X journal entry to the bank clearing account (if you open the journal you will see at the bottom the bank line - the bank account you select here will be the bank clearing account).